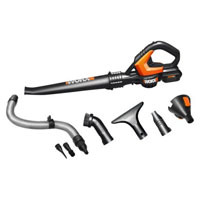 A cordless leaf blower with a rechargeable lithium-ion battery, the WORX WG545 is well suited to light yard tasks like blowing off the patio, pool deck, or sidewalk. The blower’s nozzle has a narrow range, but it’s still pretty powerful for such a lightweight device. We found that the flexible nozzle can reach narrow spaces like underneath bushes and furniture. It also has an automatic shut-off feature for when the battery is low or discharges. For a compact model, this $99 blower has good power and runs fairly quietly.